It's certainly seems fashionable on the part of many wine critics to "bash" Merlot. Perhaps this is because many wineries seem to make Merlot that's a version of "Cabernet Lite," rather than making an exceptional version of Merlot. 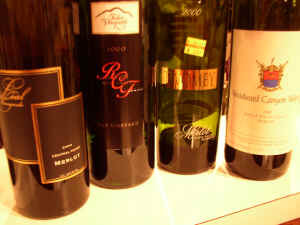 We assembled an interesting a varied set of West Coast Merlot wines. The price range was significant, to be sure. The 2000 vintage in California saw an early bud-break, so the growing season was longer than normal. This allowed for greater hang time for late-ripening varieties and ample maturation time for vines such as Merlot. We found some pretty nice wines. All but one had at least one first place vote. All eight wines had at least one last place vote! This means the final scores were somewhat closely bunched. "This is tightly wound," said one critic, "and it has anise notes with green olives and sour cherry elements with a nut-like quality and a bitter finish." Another person marked it down for having "no fruit and it's earthy and uninteresting. The fruit just seems muted." A third person was less thrilled, finding "stinky notes, tarry elements and fragrances reminiscent of burnt rubber tires. drink of red wine. Some Merlot fruit does come up a bit." 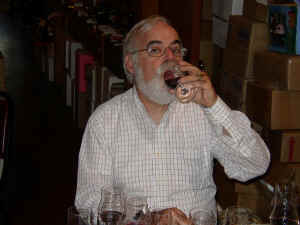 Gerald found decent Merlot fruit with some red berry fragrances and a touch of oak. The same elements come through on the palate, with a mildly perfumy note. It's a bit aggressive, but not flawed. One might criticize it for lacking a bit of excitement. This wine struck a number of tasters as being flawed on the nose. "It's got a barnyard smell," said one critic, "along with a rotten egg character." Another person found "green peppers, earth and mushrooms." Someone else found "SO2 and stinky aromas." One taster described this as having "rotten egg notes and mercaptan, but it's a ferocious wine underneath all those distractions." More positively, one taster found "leather aromas and decent fruit." Another person found a "soft mouthfeel, with currants, ripened cranberries, tobacco, coffee notes and some spice." Bob perceived the weirdness of the nose as "an aggressively stemmy/leafy herbaceous note but there's nice deep Merlot fruit with a nice oak background. Dry on the palate (to its credit), a bit austere and the fruit ends up being a bit hollow. It finishes with a green bean herbaceous note." 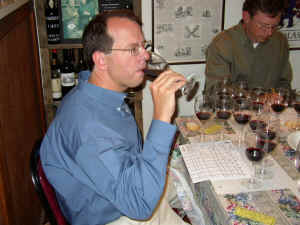 Gerald found a "weedy" or "herbal" quality to the nose, not keying on this character as negatively as did other tasters. He found a bit of green olive on the nose. The palate displays some nice ripe fruit and berry notes, with a fair bit of body and intensity. This garnered a one star rating on Gerald's three star scale (no stars being a standard quality wine, three stars being exceptional). "This has a nice nose, but it's hollow." said one critic. Another found this to be "bitter and astringent; rather Zinfandel-like." 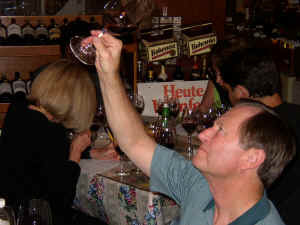 Someone else criticized Pahlmeyer's Merlot for having un-ripe notes and over-ripe qualities, saying "It's ripe, pruney and herbal." One taster described this as "plummy," while another found "pretty aromas and black cherry fruit along with raspberries and some cotton candy character with a cherry fruit finish." One person described this as "odd and bizarre, with Chinese spices such as star anise. There's a wild mulberry fruit quality and some dusty rose notes, too." Bob found "cherry jam, a bit of dust and 'pumpkin pie spice'; something else! Fair tannin but the fruit falters on the palate; an O.K. drink with a flat aftertaste." Gerald encountered some "lightly herbal notes with a hint of mocha, coffee and 'sweet' spices suggesting very ripe fruit, yet a note of less-than-perfectly mature grapes. The wine is tannic and mouth-drying with a rather hot finish." 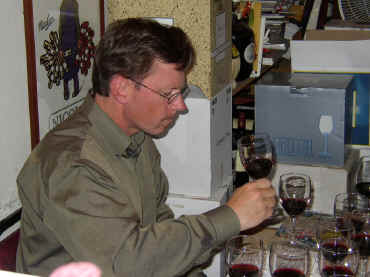 One person found some "tar and medicinal notes" in Groth's current release of Merlot. Another taster described this "methylated." Someone else detected "Bordeaux-like fruit notes," while one lady found the fragrances to be reminiscent of "patchouli and bergamot." Another person characterized this as having a "lean texture with some dusty, cedary, pencil shaving notes." Bob found it "dark toned with Brettanomyces (not so much leather as 'piss pot') but some nice Merlot fruit shows up eventually. The Brett is less aggressive on the palate with the Merlot fruit more in command but it finishes hot." Gerald found "a bit of red fruit on the nose with an almost floral tone not unlike certain Cabernet wines from Bordeaux's Margaux region. The wine is moderately tannic and perhaps a shade less 'plump' than I'd like for that level of astringency. One star." "Here's a big, bold, ripe, intense, cherryish wine with some fresh herb notes and ripened plum fruit." said one critic. Another found "raspberry jam, vanilla, cherry and strawberry notes but it ends up being uninteresting. I thought it was a pleasant, but inexpensive wine." Bob found a lot to like: "It has a nice little sharp-toned estery note (not ethyl acetate!) with sweet oak and a nice depth to the Merlot fruit, zesty and lively on nose. Zesty on the palate too; cola notes; not a lot of depth but delicious. But it finishes a bit hot." Gerald described this as showing "some sweet red berry fruit along with some cedary, vanillin oak notes on the nose. The wine shows the same elements on the palate, though it displays a bit of heat from the alcohol. One star." "Sweet Santa Rosa plum fruit is showcased here with firm tannins and ripe sweet berries on the palate...this is a balanced wine." asserted our first critic. Someone else found "sharp, biting acids," while a third taster found this to be "tannic, with a short finish." Another person detected a "mild nose," which someone else found "smooth, earthy notes and a shoe leather quality with prominent, wild berry fruit and a chocolate-like finish." Bob's take on it: "an overly herbaceous note blows off to reveal 'pretty' Merlot fruit, nice earthy tone, sweet oak, spice and hints of parsley and pennyroyal; nice but dull. On the palate sweet oak shows first but then decent Merlot fruit with balance and length." Gerald found some very nice berry notes with a woodsy character and a touch of oak. He found it more soft and supple than many of the other tasters. One star. Finishing just a point behind the first place wine is this second release of Merlot from the Silver Oak people. One taster found it "a bit barnyardy and rustic, with herbal notes, green olives and a bit of bell pepper and rye bread." Another taster found an "odd aroma of lotus root and some soy notes. There are also some nice oak and berries, though the wine is a bit hot, bitter and mouth-drying." Someone else found Twomey to be "big, thick and complex." Another panel member described this as "Cabernet-styled and it's a bit coarse." Bob's assessment: "The wine has nice earthy notes with Merlot fruit showing its 'cherry' side and indeed lots of sweet oak but the oak has finesse; impressive nose! Cherry, vaguely 'Burgundian' entry on the palate; chewy, nicely textured, fair length and a slightly flat finish." Gerald liked the sweet fruit with an herbal quality in the middle. There's also a bit of an anise note and some vanillin. The palate displays some berry fruit, mild oak tones and a bit of tannin. Quite good. Two stars. "This is rich and dense, with earthy, currant, vanillin and herbal notes." said one critic. Another found this to have be "strong on the nose, but muted on the palate. It has a touch of earthiness, with dusty and coffee-like flavors and it's the most structured wine on the palate." A third taster felt it "...has the best mouth complexity by a lot! It's got good fruit and backbone." classy oak; remarkably complex! Nice bright fruit on the palate, long, easy and at the same time serious; one nice mouthful!" Gerald found the nose of this to be exceptional, with lots of red and black fruit notes. There's a nice bit of cedar and sandalwood fragrances, making for a very complex fragrance. The wine is beautifully balanced on the palate, showing ripe, sweet fruit and nice oak. Two-and-a-half to three stars. Very fine.